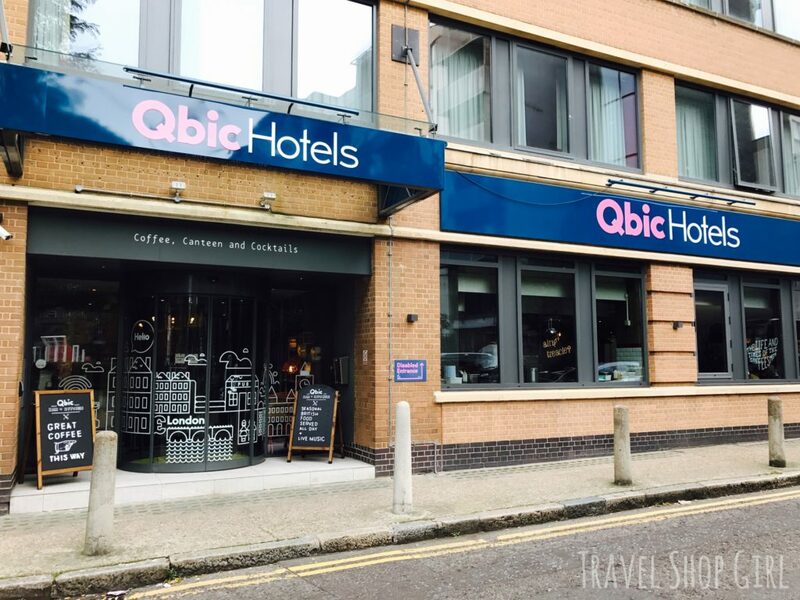 After my recent two week cruise, I returned to London and stayed at the Qbic London City in East London. 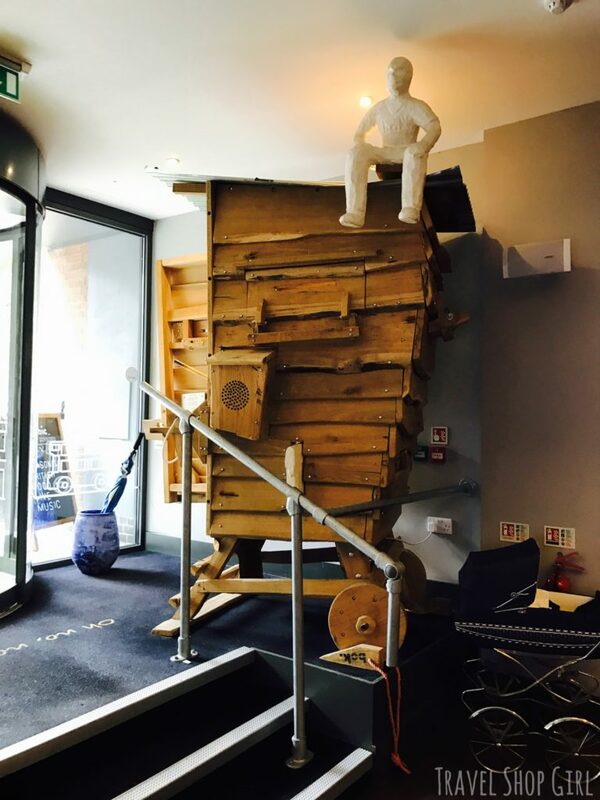 This hotel is like no other I’ve ever stayed at and for good reason. 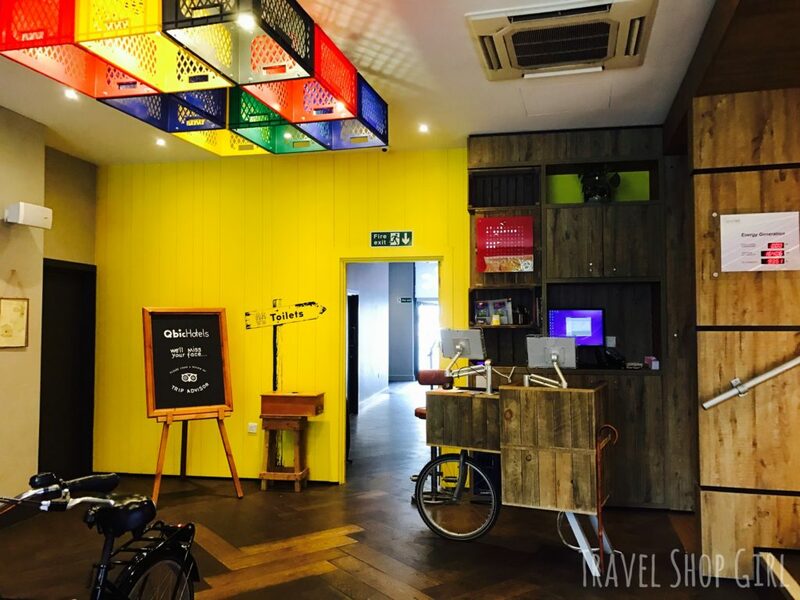 LOCATION: Located in Whitechapel, Qbic London City is easy to get to via public transportation like the Tube or bus as well as by taxi or Uber. During my visit to London the closest Tube station, Aldgate East, which is only a few minutes away, was closed for my return to Heathrow, which thankfully I knew about in advance thanks to the Transport for London website, which shows up to the minute information on closures and also helps you plan your journey. If you’d rather walk, Tower Hill was all of a 15 minute walk away to give you an idea of how close you are to everything. 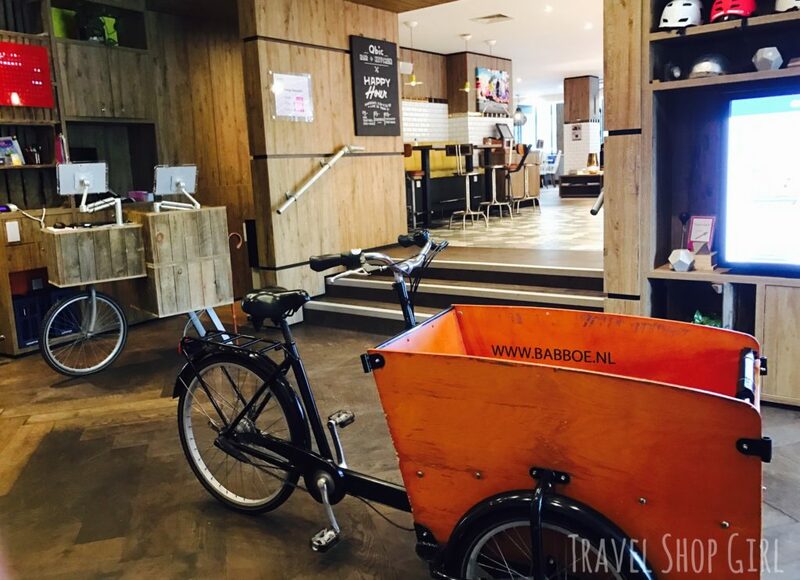 Ask for one of the free bikes if you’d really like to get out and explore. 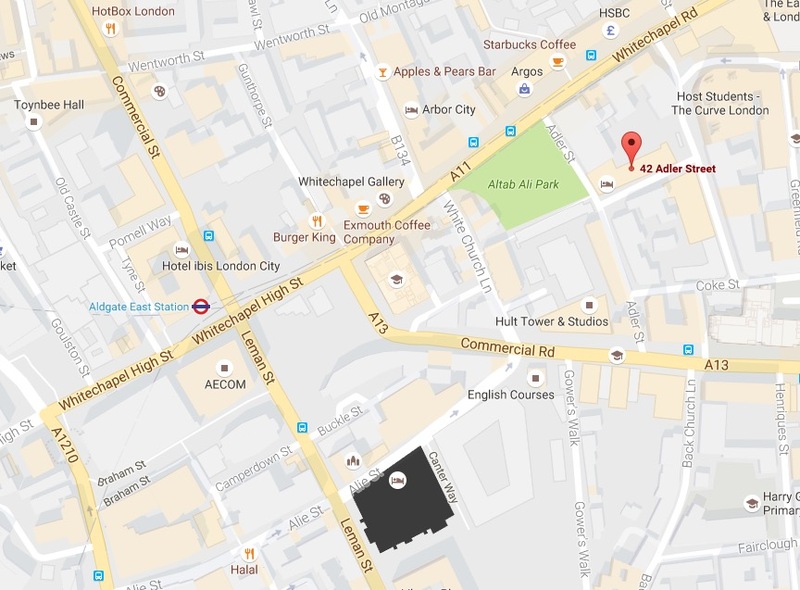 WHAT’S NEARBY: You’ll find everything you might need for food and beverages at Tesco Metro (the bigger version of Tesco Express) around the corner on Fieldgate Street, a Tesco Express on Whitechapel Road, even dare I say a Burger King and Starbucks for diehards as well as many pubs and restaurants. Instead of tearing down established buildings, Qbic renovates buildings quickly in the most efficient and greenest ways by putting everything into a cube. Hence the name, Qbic. 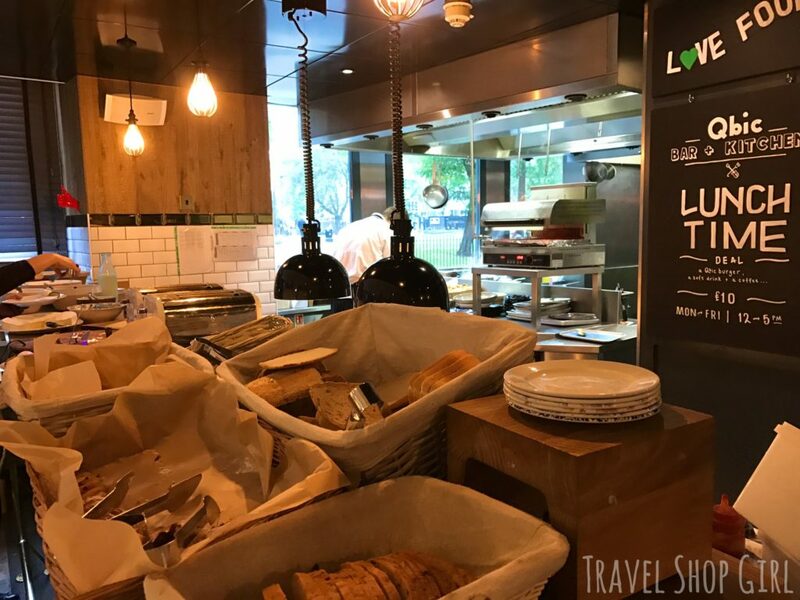 PRICE: Although it’s said that the average hotel room in London costs about £135 a night, many of the name brand hotels go for £300 or more or night. That’s why it’s nice to know you can get a room at Qbic for far less than you’d have to pay elsewhere. 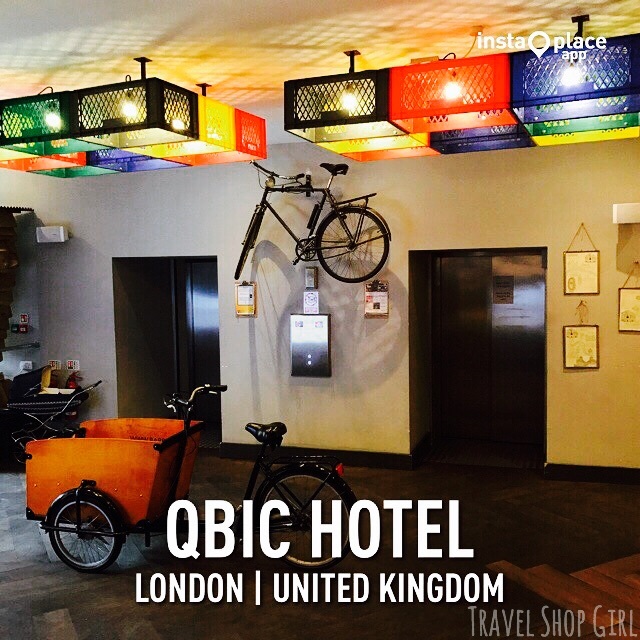 Upon entering Qbic London City, you’ll realize this is no ordinary hotel. 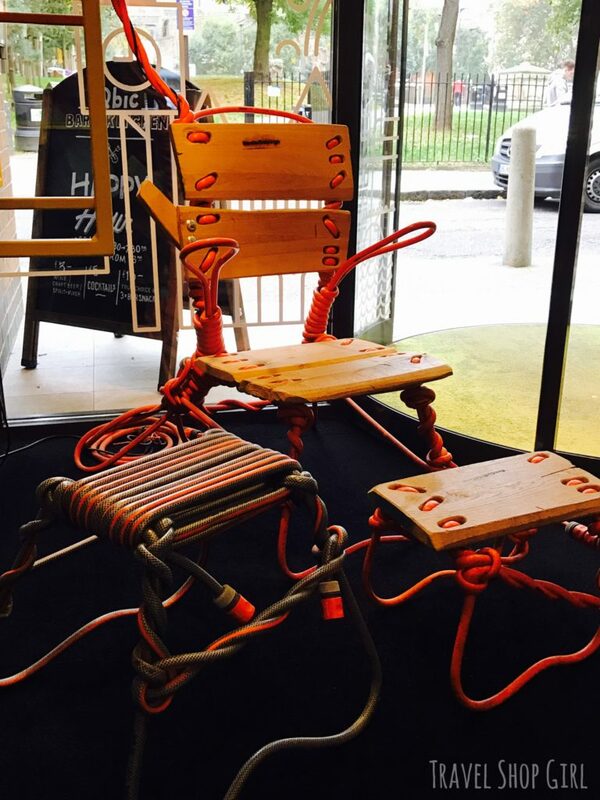 It’s fun and quirky – like me. DESIGN AESTHETIC: If you haven’t figured this out on your own already, I would call Qbic‘s style fun urban industrial. Yes, it has all of the basic design components of industrial style, but it’s fun. 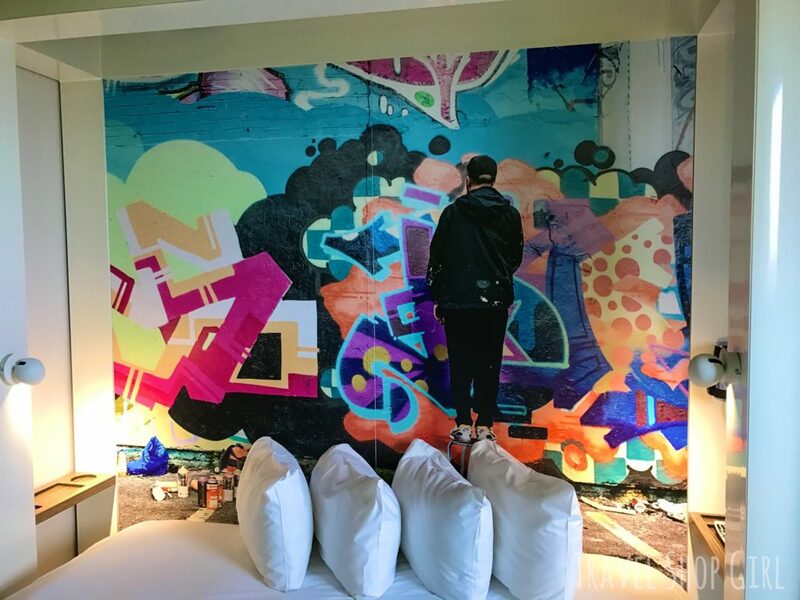 Wait til you see the rest of the hotel so read on. After checking in at the front desk, I made my way to the elevator and was surrounded by #QbiQuotes and even a guitar. Everyday the quotes change so make sure to check the new ones as they are guaranteed to put a mile on your face. 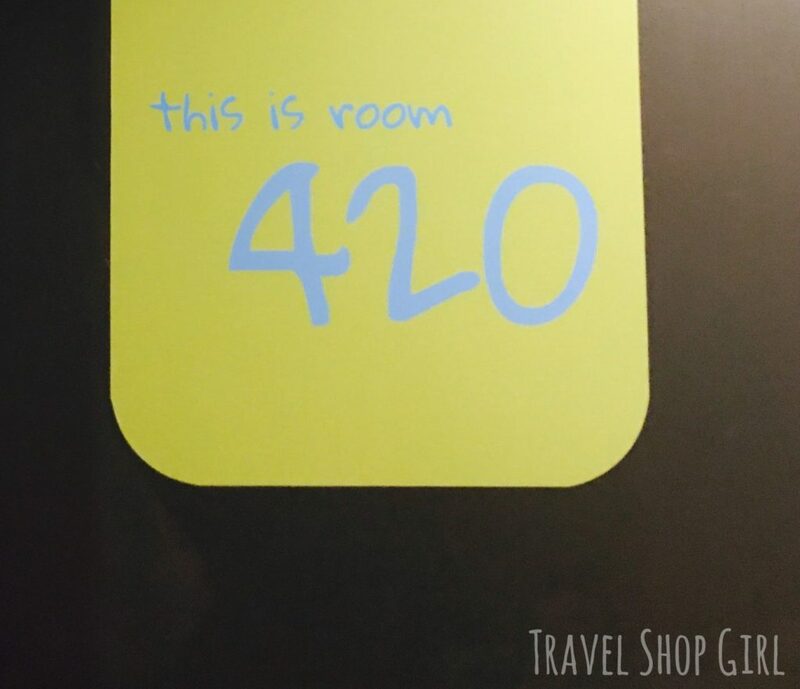 I got off on the fourth floor and followed the signage to my room, which was number 420. No jokes, please although I did enjoy a little chuckle of my own. This is what Qbic calls a Cosy Room (Standard Double). 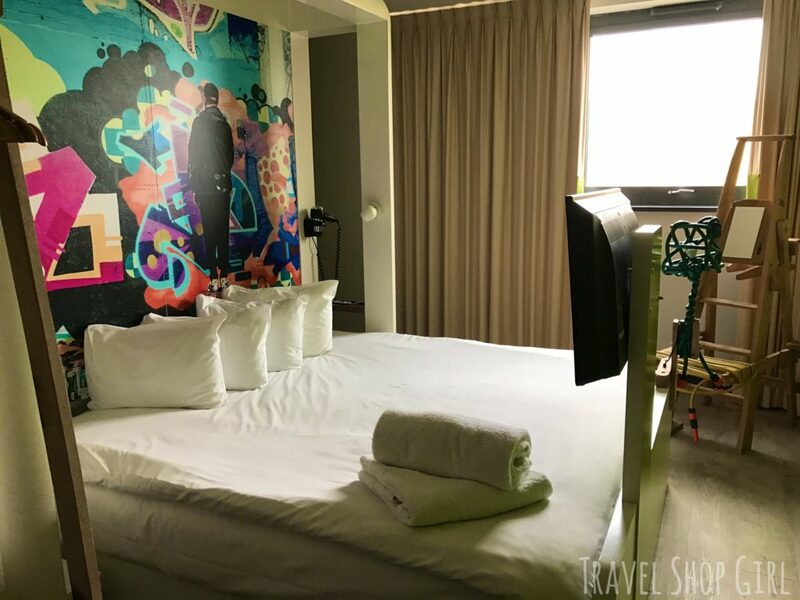 I was expecting a generic and sterile room, but instead I found a comfortable and inviting one built with sustainable materials and everything you need including wardrobe and dress mirror by Sander Bokkinga, table and chair, an in-room safe, and a hair dryer. Did you know that they can install their “cubes” in less than two hours with everything that you need including the bed, bathroom, lights, and power? This allows them to reuse the building efficiently rather than destroying it and starting all over again. Pretty cool, right? When it’s time to go to sleep, jump right into your super comfy bed. This is the Naturalmat Superking bed from a UK company in Devon, which makes their beds from all natural ingredients. What’s inside? All natural fibers, organic lambswool, which has natural anti-pest properties, organic coir fiber to enhance ventilation, and horsehair for resilience and springiness. These all combine to create the best night’s sleep you’ve had in years. While it was comfy, I loved the headboard and the abundance of pillows. All of the reading and mood light controls as well as outlets are located in the wall surrounding the bed so you can relax and unwind without having to jump up and out of bed to shut off the lights. One of my favorite things about the room is that the 32″ LED TV is placed at eye level at the foot of the bed. You’ll find information about the hotel on the wall and a cute little dog that you can hang on your door to let housekeeping know to skip your room. If you do, you get a free drink at the bar. Sounds good to me. I loved the bathroom with it’s zebra wood-like sliding door and huge rain shower. Considered the best rain shower in London, it uses a water and air system that actually reduces the amount of water used. Oh and the mirror is a steam free one — totally awesome. Continuing the green theme, the “Stop the Water While Using Me” luxury eco and chemical free bath products smell good and slap you in the face in a gentle way with their eco-conscious theme. In addition to the bottle of filtered water left in your room at no charge, I couldn’t pass up the free tea and coffee located only a few steps from my room. Consider taking the stairs down to the lobby to check out the artwork on each floor. Each had a great variety of photography and paintings, most from locals. 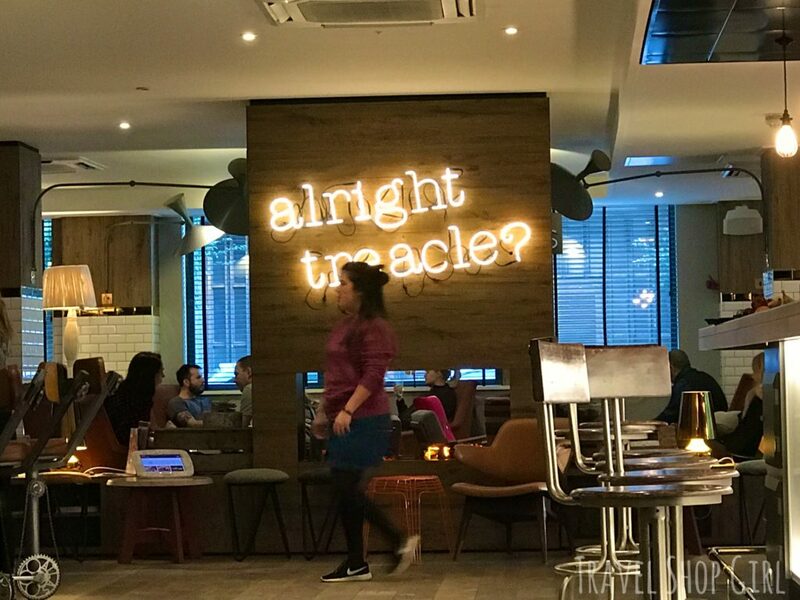 The signage in the bar says, “alright treacle?” If you don’t know what treacle is, it’s molasses. Regardless of the sign, you can see this was a place where people went to gather any time of the day. EMPLOYEES: No matter where I turned, everyone was asking if everything was ok or if I needed help. No one ever stood still and they were working constantly to clean tables or offer assistance. 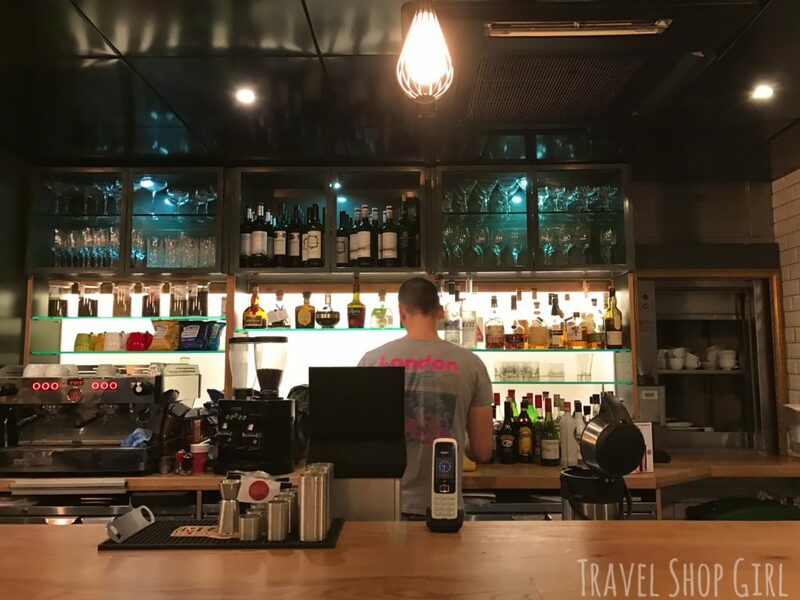 RESTAURANT AND BAR: If you’re looking for a beverage or something to eat, this is where you can go to grab something in Bar + Kitchen. 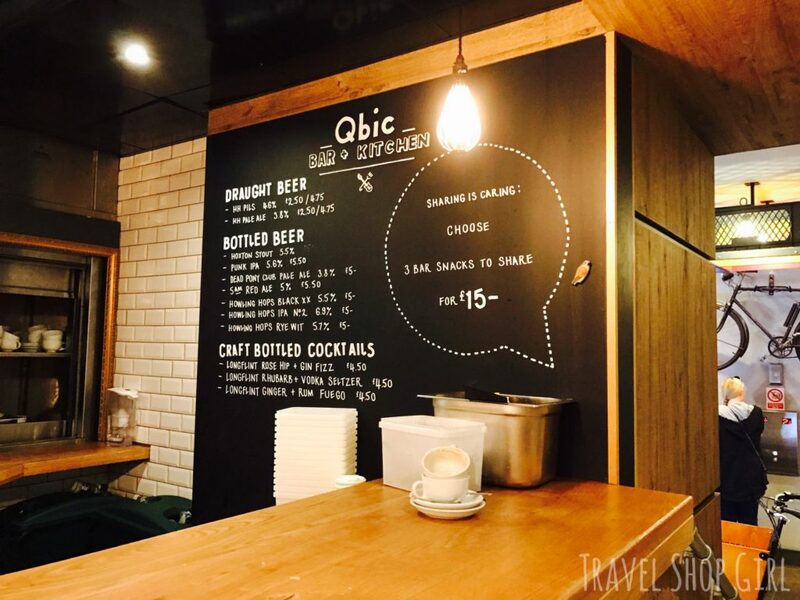 Qbic Bar + Kitchen is a casual urban restaurant and hangout where you can enjoy seasonal British produce with a modern take on classic dishes like roast aubergine masala with fresh salad and chapatti or maybe a Proper Scotch egg. Wash it down with a pint, a glass of wine, or maybe a Qbic Mojito, a Solo Traveller, or the Mexican Business Man cocktail. With lots of seating options, people can sit here to chat, eat, or go online. 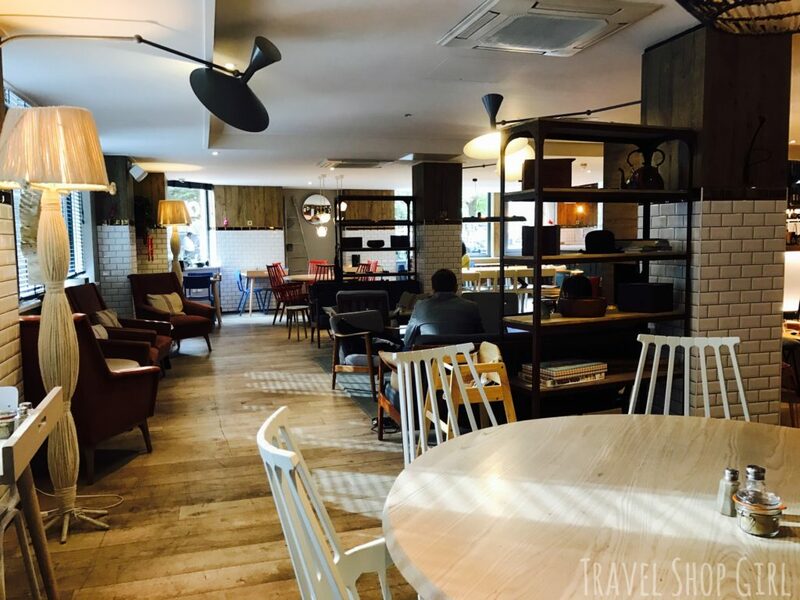 With free WiFi throughout the hotel, you don’t have to sit here to go online, but if you do, why not with a drink (or two). 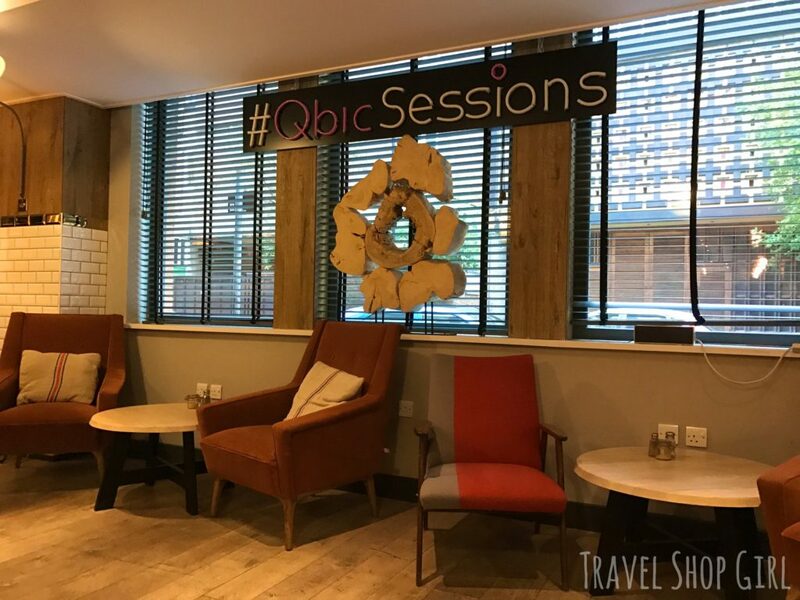 Every month Qbic offers a series of “inspiring creative experiences ranging from live music to spoken word and DJ sets” in house. BREAKFAST: The included breakfast was a feast of yogurt, fruit, meat, cheese, bread, and more. We’re not talking stale pastries and cereal, but good food to help start your day. 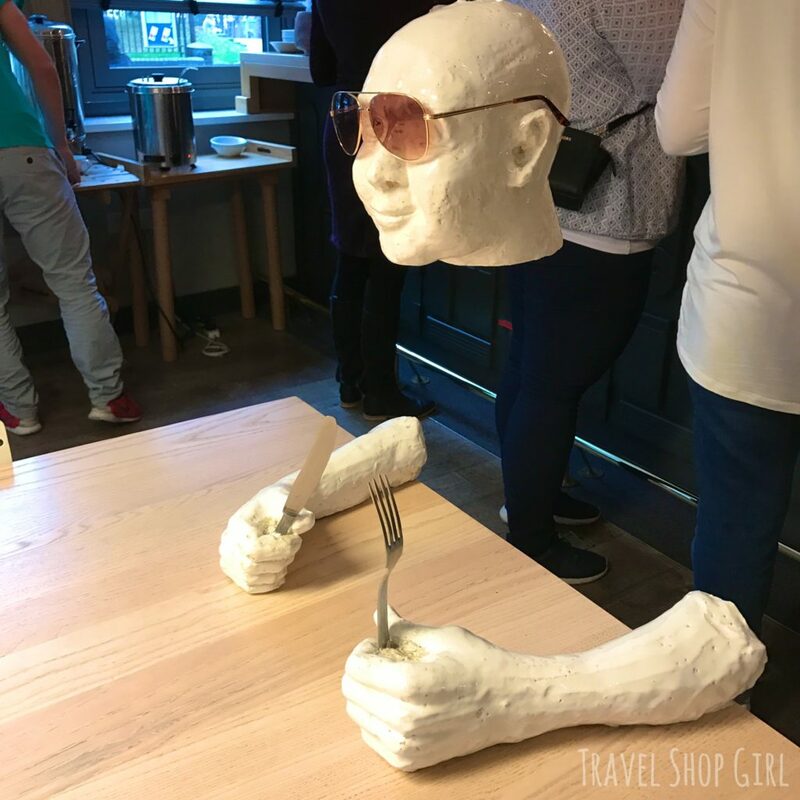 Every time I walked in or out of the hotel I seemed to find more of the hidden art and sculptures that makes this place so unique. I call this one guy looking over his children. Yes, that’s a pram or stroller nearby. 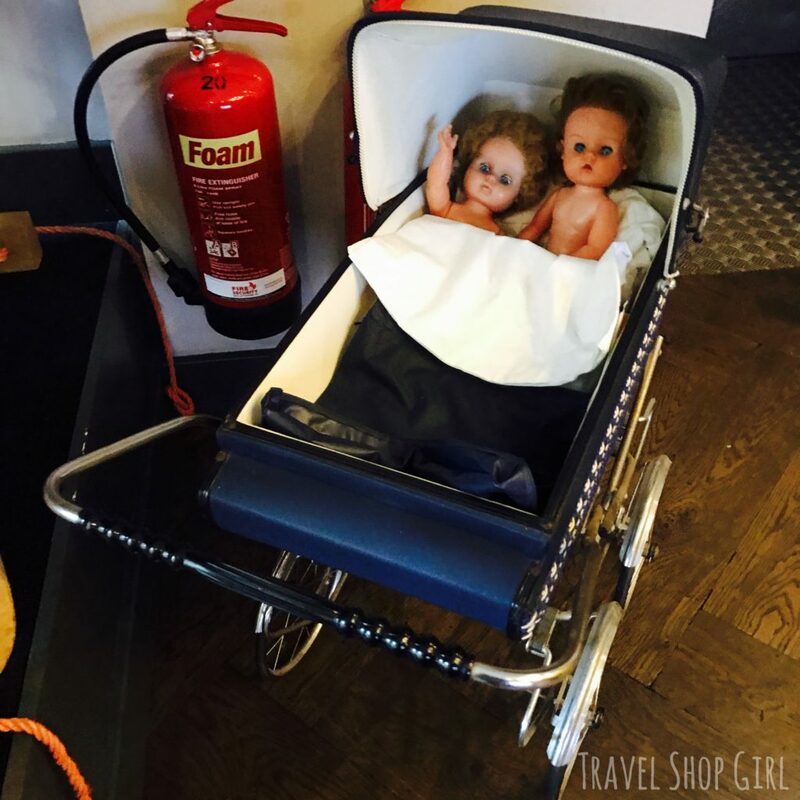 I mean c’mon — where else will you find a baby carriage with two dolls inside and somehow it seems to fit in like it belongs? I’m just hoping they leave that fire extinguisher alone as those girls look like trouble. 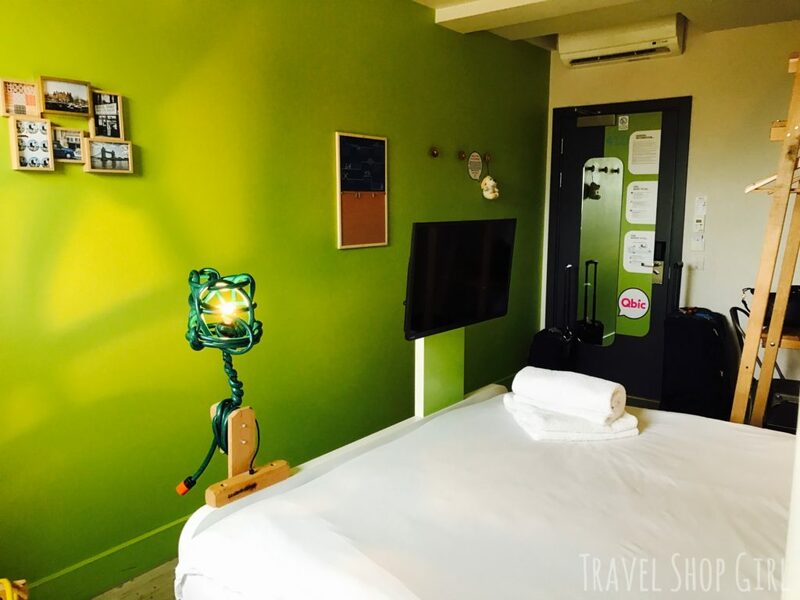 If you’re looking for an affordable hotel option in London that is environmentally conscious and doesn’t just say so, but really is (they’ve won awards after all), then consider a stay at the Qbic London City. 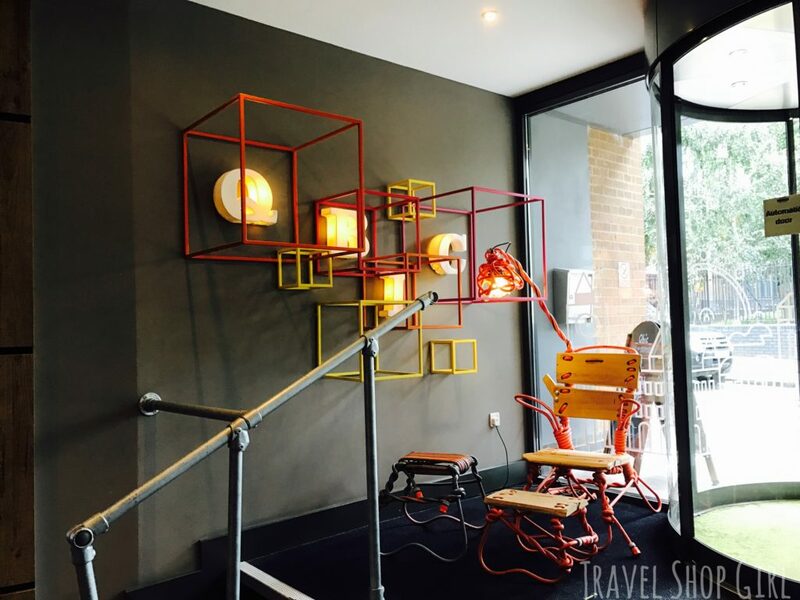 While I was generously provided discounted accommodations by Qbic London City, all opinions and photographs, unless otherwise noted, are my own.